This house is named after the three families that once owned it. In 1985 it was moved to this spot from the course of the Monksville Reservoir. Probably begun before the Revolution, the house first appears on tax records in 1780. 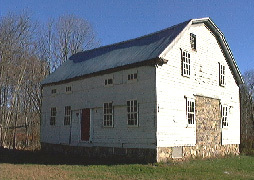 It was a farm house not owned by the Ironworks company but a home on one of several "satellite farms" that were part of the economy generated by the ironworks. Very much a company town, the Ironworks village was the center of a "plantation economy" that relied on a satellite population to grow crops, raise draft animals and perform such services as teamstering, charcoaling, etc. 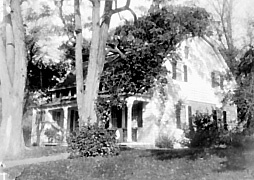 After many years as a farm house, the building was used as a restaurant and went by many names such as the Wanaque Valley Inn, the Copper Kitchen, the Paul Bunyan Inn, and most recently the Holy Mackerel Seafood Restaurant. Plans for this building include restoration and adaptive reuse, possibly as a craft shop or tea room.